Dematoligists have reported a rise in the number of parents and carers presenting with allergic reactions after using disposable baby wipes. 6 months ago - I was one of them and the experience was horrific. First and foremost, I am very glad that my newborn daughter did not have a reaction to the wipes. During the first couple of weeks after my daughter's birth, I started using the scented baby wipes from Aldi. After about a week, developed a raised, raw, red rash of the back of my right hand. The reaction was so bad that my Doctor recommended I plaster my hands in a base barrier cream followed by steroid cream and finally wet cotton gloves - day and night. Can you imagine doing this while handling a newborn and a 3 year old? Impossible! 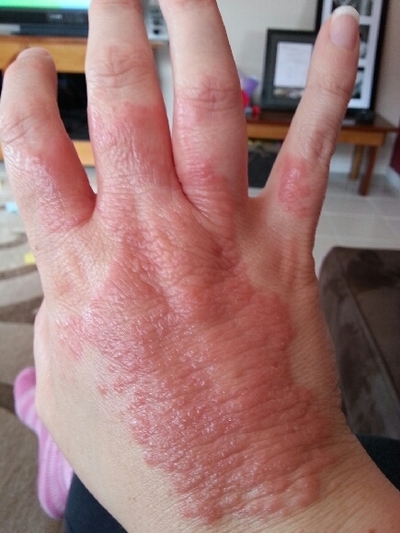 After using scented baby wipes, my hand developed this allergic rash. At the time, I assumed that the reaction was due to my sensitive skin, however, following this recent news story and the fact that the rash cleared up when I stopped using the scented wipes, I can quite confidently conclude that it was as a result of the products ingredients. 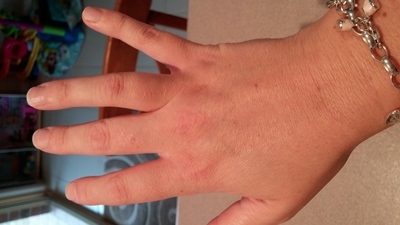 My hand today, free of the allergic reaction. This is a concerning trend. Perhaps the suppliers of these products need to invest more time and money into product testing and allergies. The wellbeing of our children is our first and foremost priority and the last thing you want is for a product you use everyday to cause such a damaging allergic reaction that could lead to skin sensitivity in the future. Have you suffered from an allergic reaction from using baby wipes? What brand caused the reaction and how did you fix the problem? Can you ever truly relax once you've had kids?